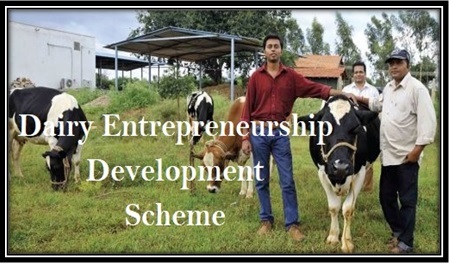 The government has introduced the Dairy Entrepreneurship Development Yojana with an aim to improve dairy sector industry and at the same time try and generate better self employment opportunities for people linked with this industry. Aim Increasing milk production in the country via dairy management programs. The new scheme launched is aimed to help the government generate much better self employment opportunities and at the same time improve and introduce better infra structure for improving the dairy industry. Under the scheme it is certain that the government aims at setting up dairy that are equipped with updated modern technology in the farms. Apart from this the government will also help improve quality of milk produced by introducing better infra structure. It is also certain that the government is aiming at encouraging the rearing of better heifer calf so that better breed can be conserved and developed for future dairy farms in the country. Under the scheme it is also obvious that the government aims at regulating and making all possible structural changes so that at the village level itself the processing of milk can be done at the initial stages. It is also certain that the government aims at offering better value for milk production by upgrading the technology for milk production from traditional to modern on a commercial scale including all milk products. Anyone who is a farmer, organized or unorganized group, individual entrepreneur, members of the self help groups are eligible to get the full benefit under the new scheme. Apart from this all milk unions and its members, dairy co.op. societies, Institutions under Panchayat raj, milk federations are also eligible to take full benefit of the new introduced scheme. To get full benefit of the scheme it is certain that any individual should have been registered only for single component under the scheme. In case more than one member belonging to the same family want to get the benefit then they have to get registered under distinct units. Each one of them should have their own infrastructure set up at different locations. Under this circumstance it is important that a valid distance of around 500 meters should be maintained between each of the separate units set up. The government has also prepared a list of banks that shall offer assistance under the scheme. Rural bank, regional bank and urban banks are included in the list. Government has also selected commercial banks and state owned co. op. banks including Rural development banks to offer finance to the scheme. Nabard will be responsible for implementing the scheme in the various UT’s and districts or states across the country in various stages. Under the new scheme it is certain that the Government has offered with a marginal amount for entrepreneurs’ contribution for the loan amount that is more than Rs 1 lakh will be around 10 percent of the overall project cost. 25 percent subsidy rate will be offered as back ended capital of the entire project cost in the candidate belongs to the General category. In case the candidate belongs to the ST or SC category then he or she will be offered with around 33 percent subsidy rate on the same. Apart from this subsidy ceiling rates will be finalized on the basis of rates provided by NABARD. Bank loan shall be calculated in well balanced proportion as depending on the regulations provided by Reserve Bank of India. It is certain that NABARD is expected to work in with various UTs and Government of the state’s for implementation. It is also certain that banks may be instructed to give priorities to Women and farmers in SHGs Category, milk marketing and value addition. The government has already made it very clear that it has set budget of Rs 240 crore for the current fiscal year 2017-18. The government will include the set budget under different categories – Rs 38.33 crore for SC component (MH2404), Rs 181.12 crore for General component (MH2404) and Rs 20 crore to be invested under NE Region (MH2552). It is also certain that the scheme to be launched has been implemented in 31 distinct states of the country. Each of the state has also set its own budget to be followed for the implementation of the scheme.